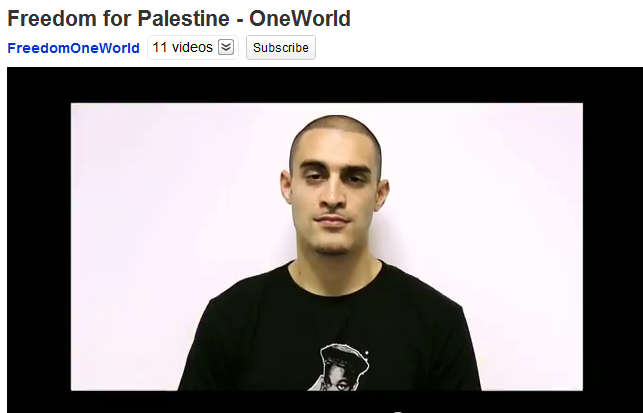 Brainwashing your daughter the Palestine Solidarity Campaign way. 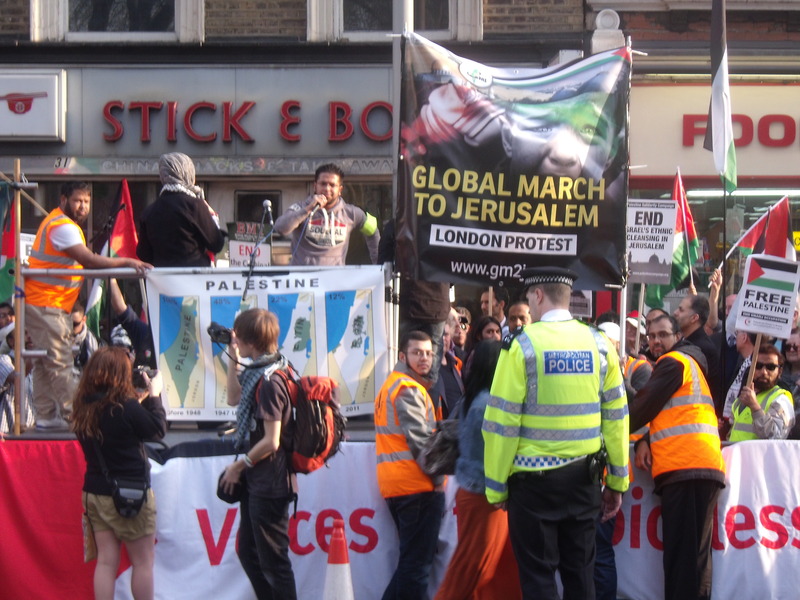 A Global March to Jerusalem activist yesterday. 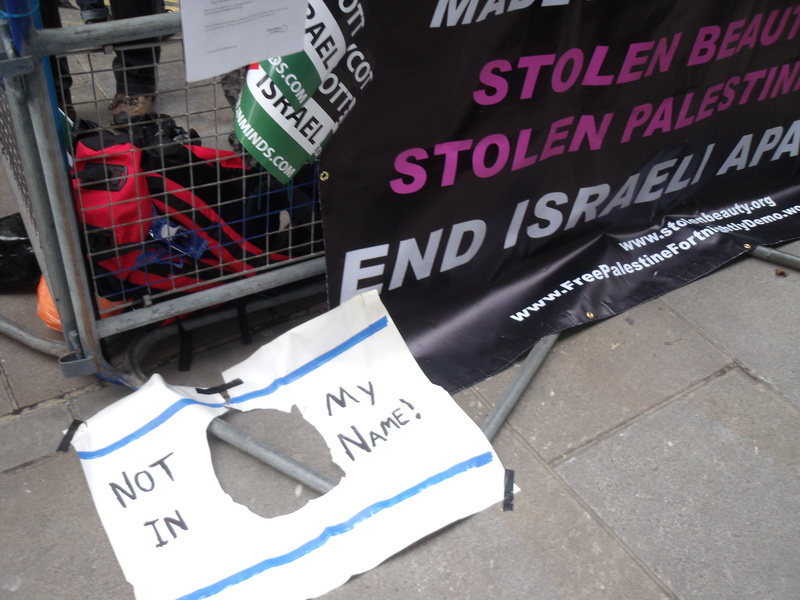 At the PSC’s “Global March to Jerusalem” outside the Israeli Embassy yesterday from 5pm to 7pm a three-year-old girl listened to two hours of hate-filled chanting and sermons before being called to the platform by her mother. The little girl had heard repeated calls for Israel’s destruction and some things said about Jews in Arabic, which I didn’t understand. 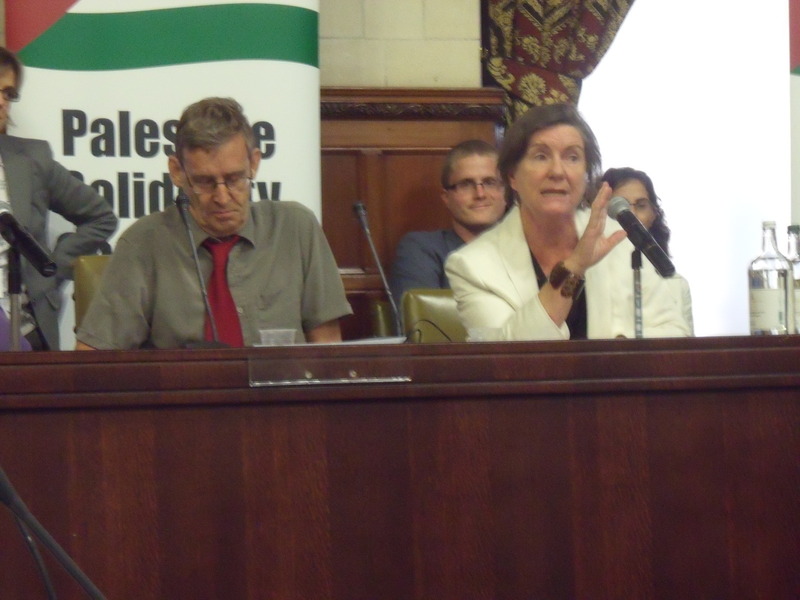 It was Karmi, of course, who recently sat silently by as Ken O’Keefe compared Jews to Nazis. 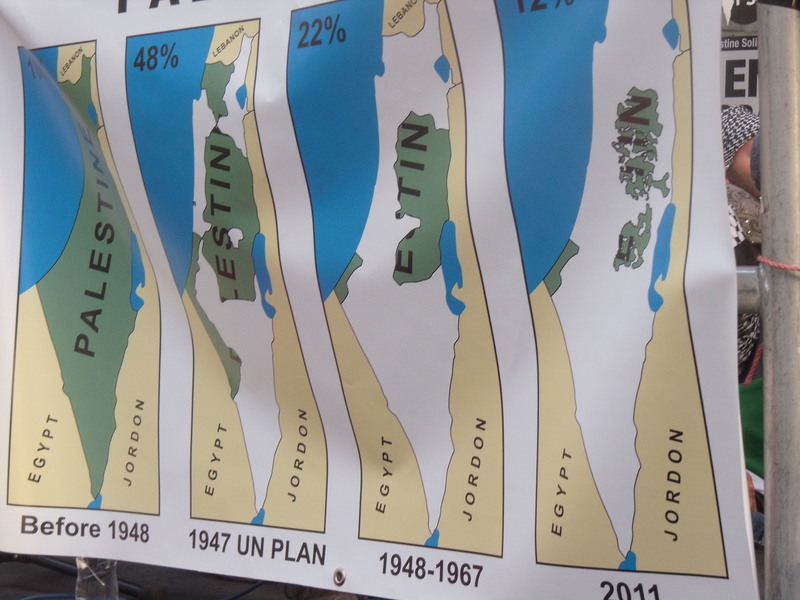 Karmi doesn’t seem to trust Jews to look after Jerusalem, but when the Jordanians controlled Jerusalem from 1949 to 1967 Jews were forbidden to visit it and its Jewish cemeteries were desecrated. Now people of all faiths can freely worship there, as long as your intentions are benign. 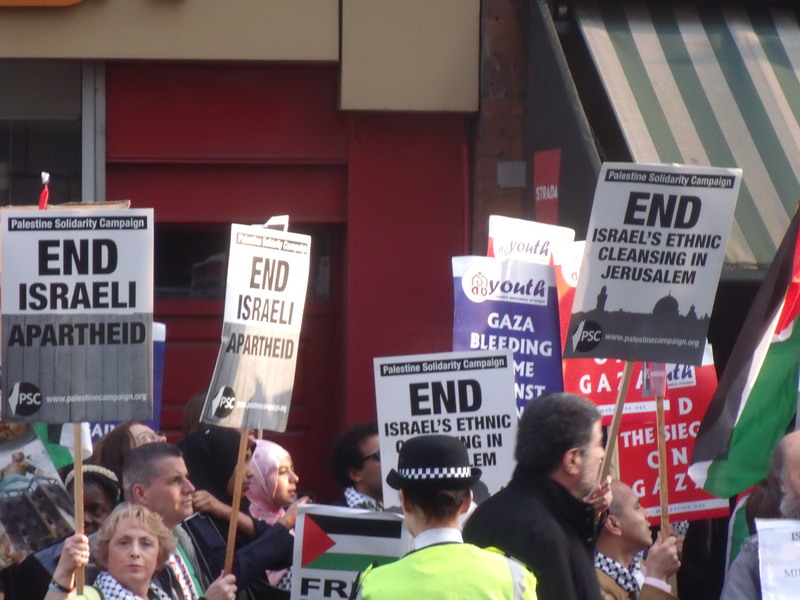 The “Global March to Jerusalem” turned out to be nothing more than a couple of hundred indoctrinated Israel haters taunting an empty Israeli Embassy building. 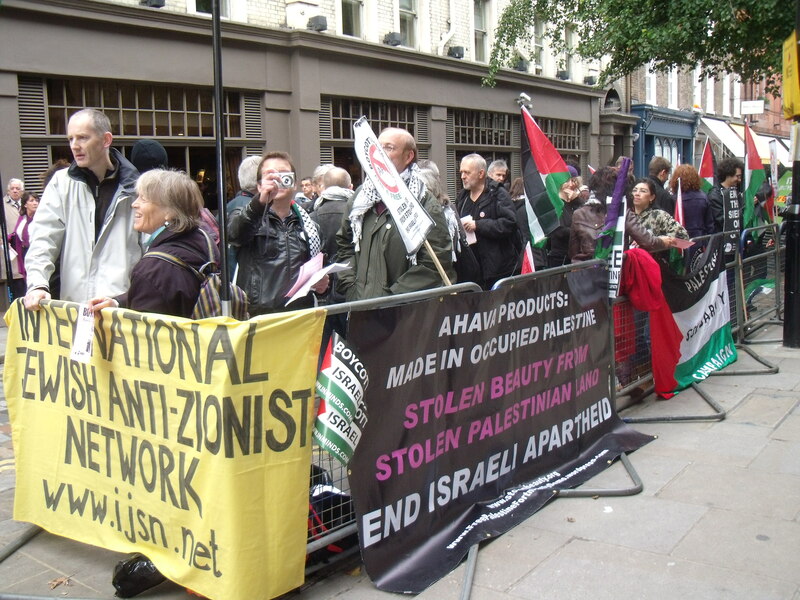 On its newsfeed Iran’s Press TV mocked the paltry turnout of pro-Israel activists and PSC head-honcho Sarah Colborne announced, to cheers, that those activists had left early. Note to Press TV and Sarah Colborne: Friday night is Shabbat, the holiest and most precious time for Jews. They are with their families. That is why only 20 came and why those that came left early. As I walked back to the tube I chatted to some of the protesters. I asked two teenage girls what they were doing to stand up for their oppressed sisters in Saudi Arabia who are not allowed to show their faces like these girls were doing. They answered that the Saudis treated women with more respect than women over here get. I asked a teenage boy whether he supported suicide bombings inside Israel. He said it was a response to having your land stolen. With such sentiments you can start to understand where Toulouse Jew murderer Mohamed Merah came from. The 2 middle maps are correct but the other 2 are laughable. 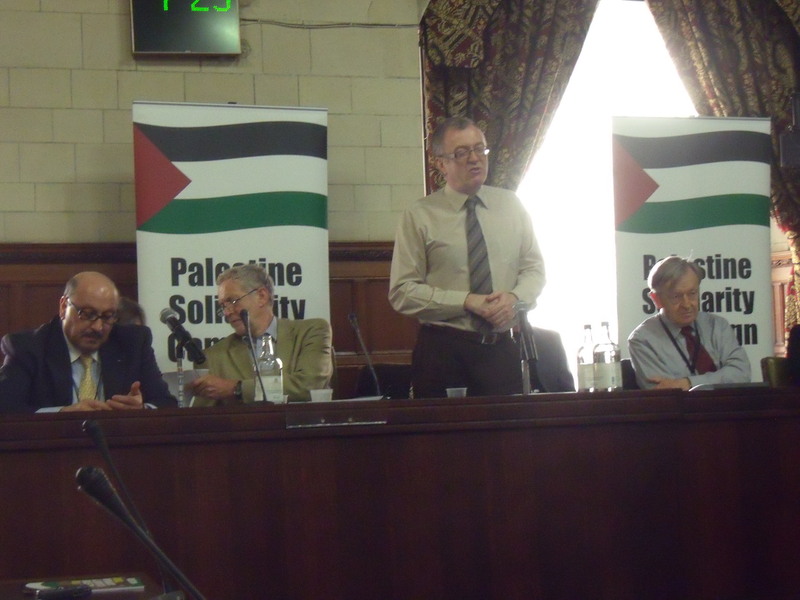 ex-MP and head of Labour Friends of Palestine, Martin Linton. It’s Saturday and that means anti-Israel protest outside Ahava. The protest started an hour earlier than usual because some protesters had to shoot off to an anti-fascism and anti-Islamophobia rally. So many protests, so little time. 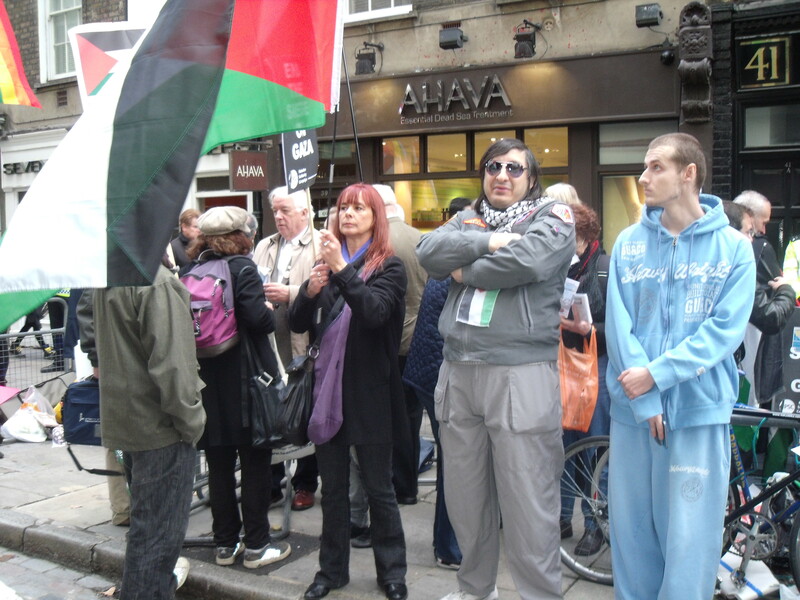 After a year the Ahava protests are finally starting to attract some celebrity anti-Israel activists. 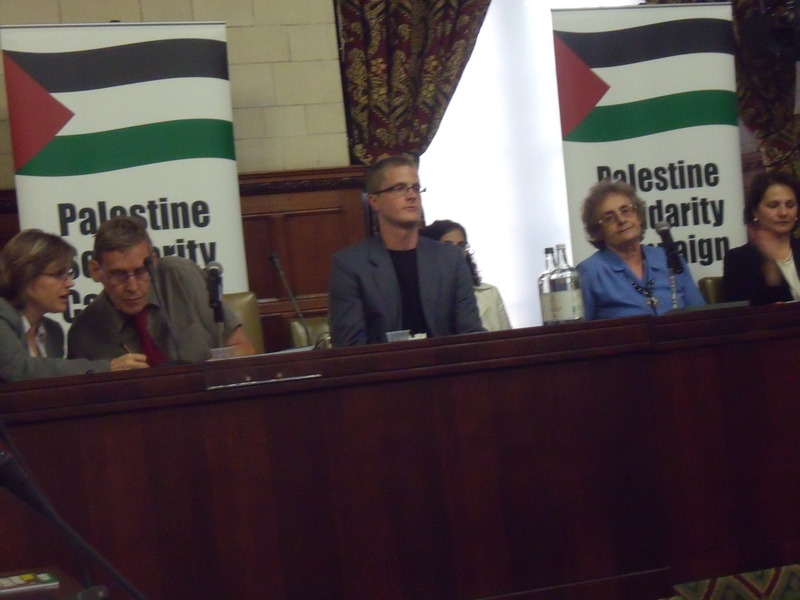 Two weeks ago Sarah Colborne, Director of Campaigns and Operations at the Palestine Solidarity Campaign, made her first appearance. 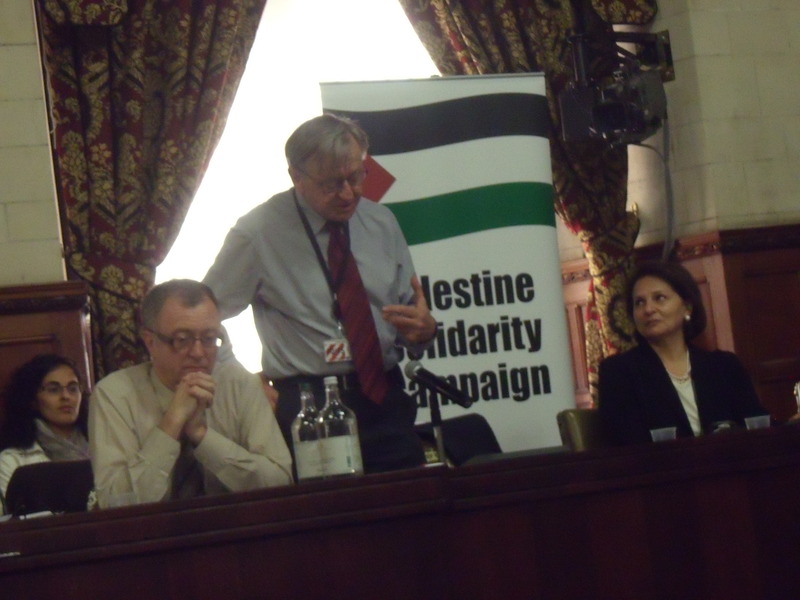 She was present again this week but there was even greater royalty in the form of Martin Linton, Chair of Labour Friends of Palestine, who lost his Battersea Parliamentary seat in May. In March Mr. Linton told a meeting in Parliament that Israel was using its long tentacles to fund British election campaigns and to buy Conservative support. His speech made front page headlines. I did suggest to him today that if he switched sides then this all powerful pro-Israel machine might win him a place back in Parliament. Sadly, he declined the offer. 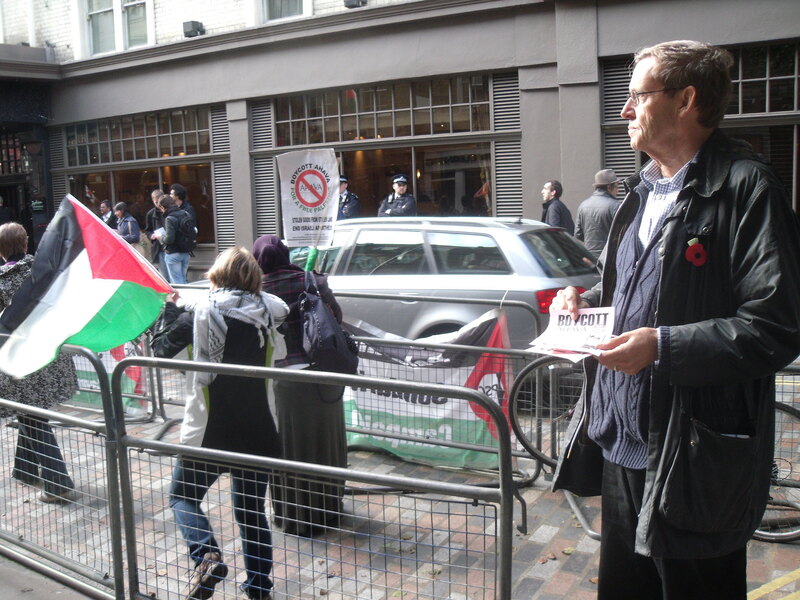 Meanwhile, ever present Bruce, chief secretary of AAAUK (Americans Against Apartheid UK) took the opportunity to tell passers-by that disagreed with him that they were fascists (clip 1 below). 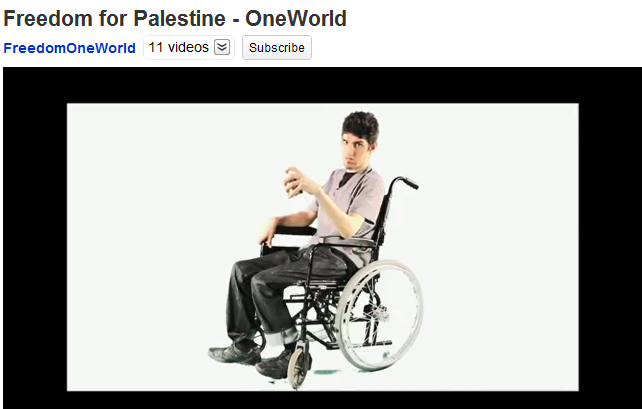 Others were content to hold up pictures of dead Palestinian children while describing pro-Israel activists as “bloodsucking” (clip 2 below). 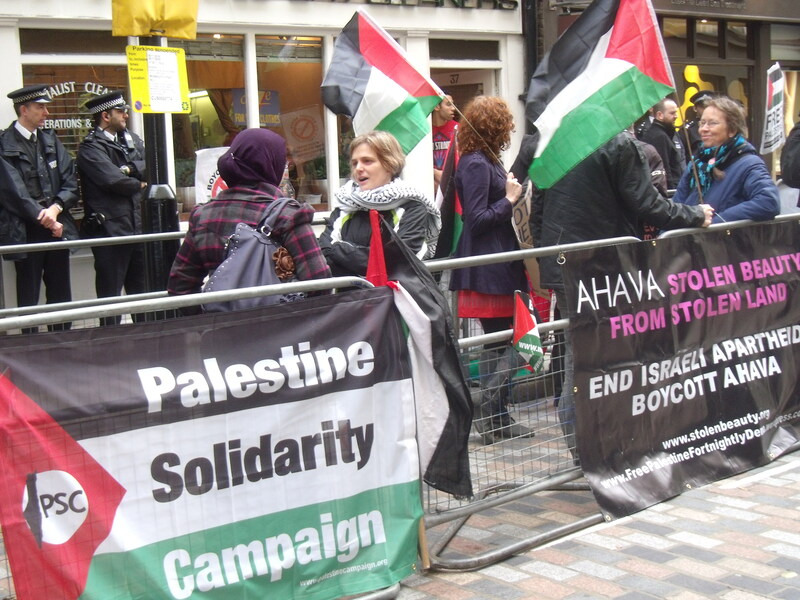 In two weeks time it is Ahava BUYcott weekend where you can obtain a 10% discount on Ahava products and then wave your purchases at the anti-Israel protesters as you exit the store (39 Monmouth Street, Covent Garden). Always fun. Palestine Campaign head visits her troops on the front line. 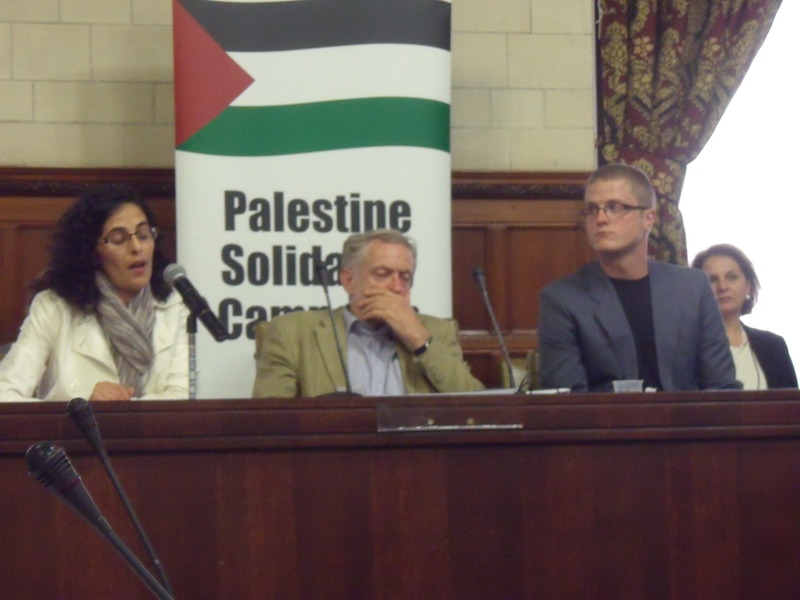 Sarah Colborne, Director of Campaigns and Operations at the Palestine Campaign, made a surprise visit to inspect her troops on the front-line on Saturday. 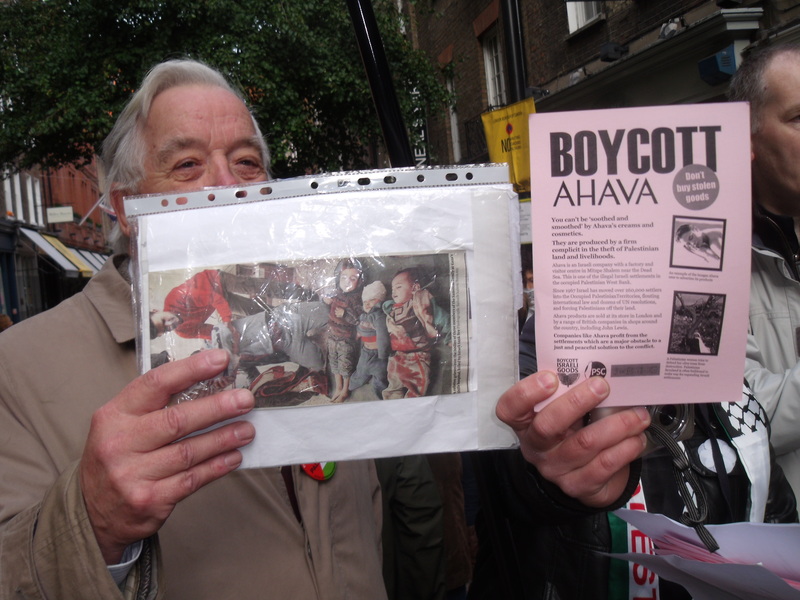 The Palestine Campaign sponsors the fortnightly anti-Israel demonstrations outside Ahava paying for the thousands of leaflets that are distributed to passers-by. There are obviously times when the planet need not be spared. 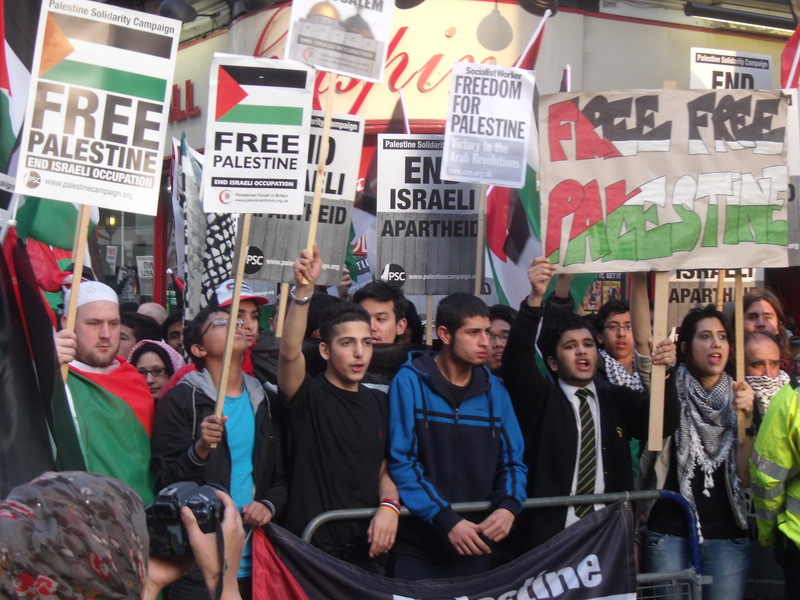 Anti-Israel activists were well down from the usual number. Bruce Levy, head-honcho of the troops on the ground, said everyone was at the Anarchist Bookfair. Some did saunter along later to boost the ranks of the faithful. The English Defence League were allocated their own pen by the police. 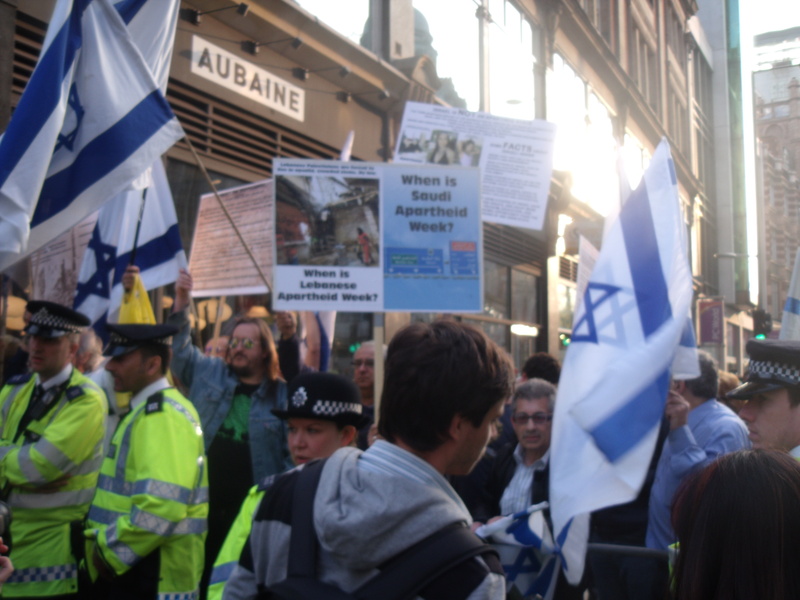 As soon as the EDL arrived anti-Israel activists tried to capture that all important photo of a counter-demonstrator standing near the EDL so they can smear the counter-demonstrator as a racist. 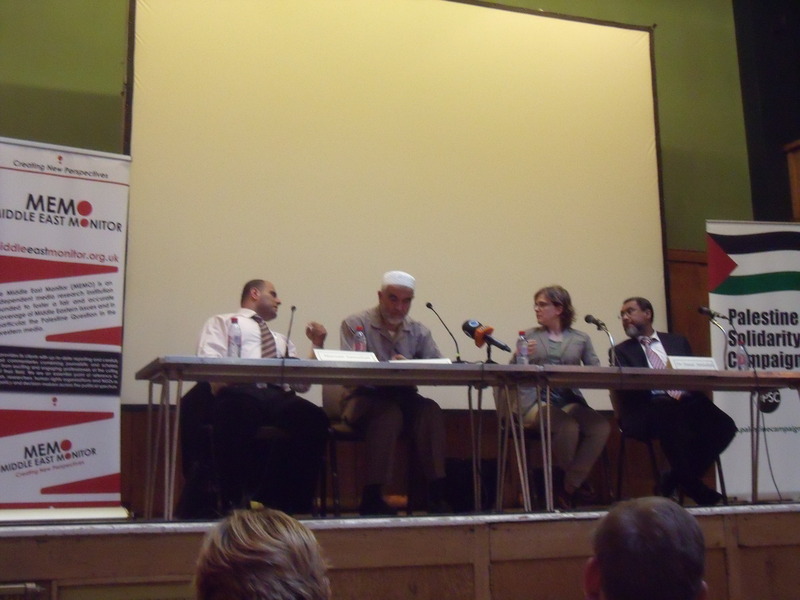 This time there were just four EDL members present. 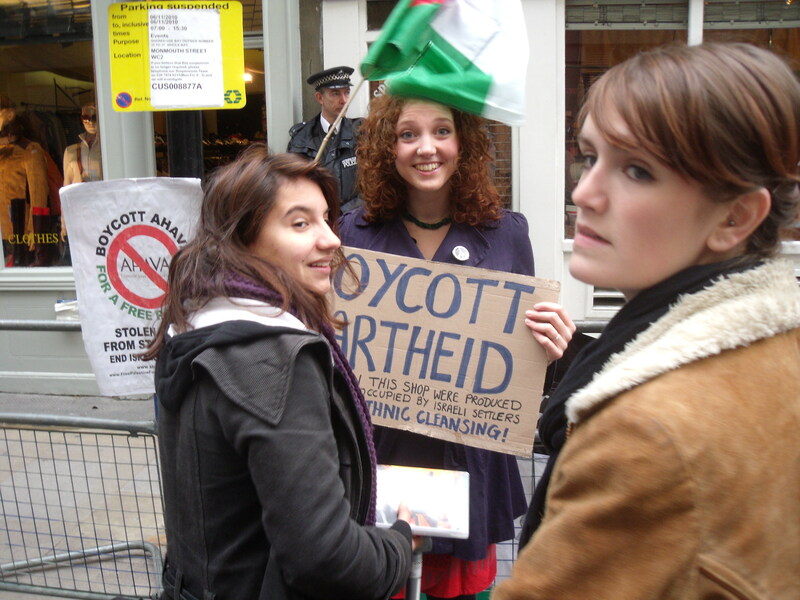 As well as showing support for Israel they spent most of their time protesting against Hamas’ hatred of gays. 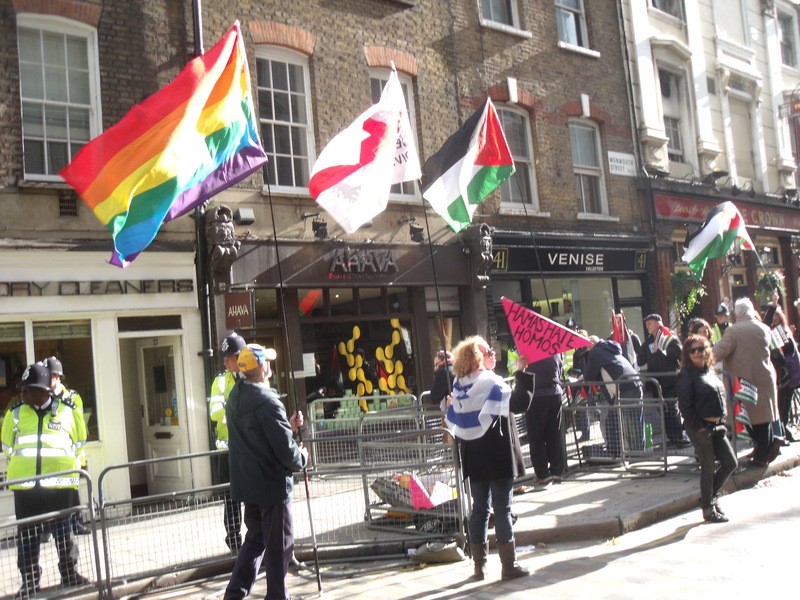 The day turned into the battle of the flags with the Flag of St. George and the gay rights flag hoisted in the EDL pen and Palestinian flags flying in the anti-Israel pen. And on top of all the other celebrity boycotters even Elvis Presley came back to make an appearance in the anti-Israel pen. 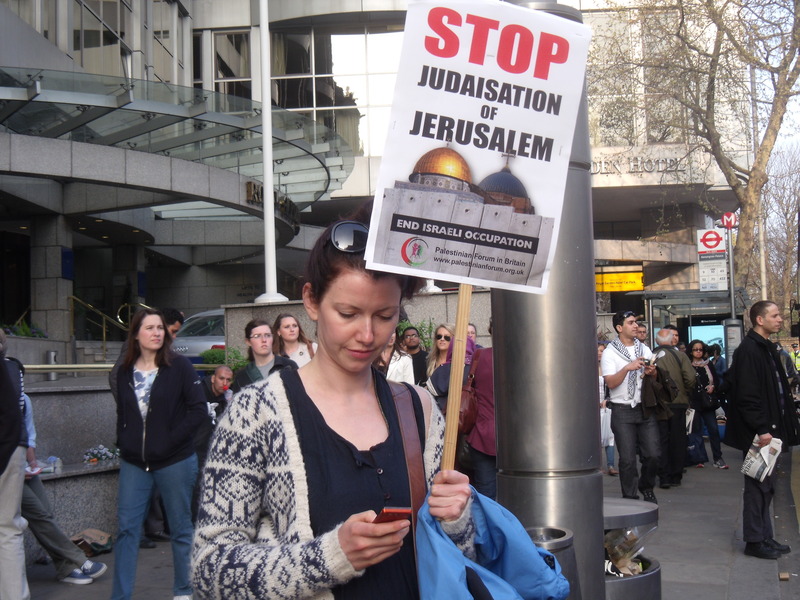 As the Palestine Campaign is the chief sponsor of all these anti-Israel protests a few pro-Israel counter-demonstrators took the opportunity to make their objections known to Sarah Colborne. 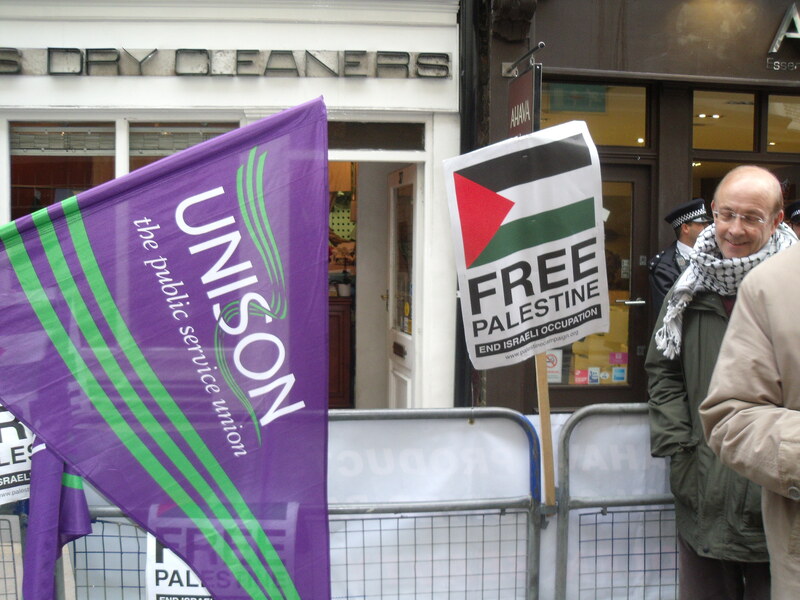 Now, I have no major problem with someone being anti-Israel, if that is their wish, but surely it isn’t too difficult to denounce an organisation that expressly wishes to kill Jews. Call me old-fashioned. These days one has to make an expressed and clear denunciation of the EDL to prove that one is not a racist but not denouncing a proudly virulently anti-Semitic organisation like Hamas is, apparently, just fine. 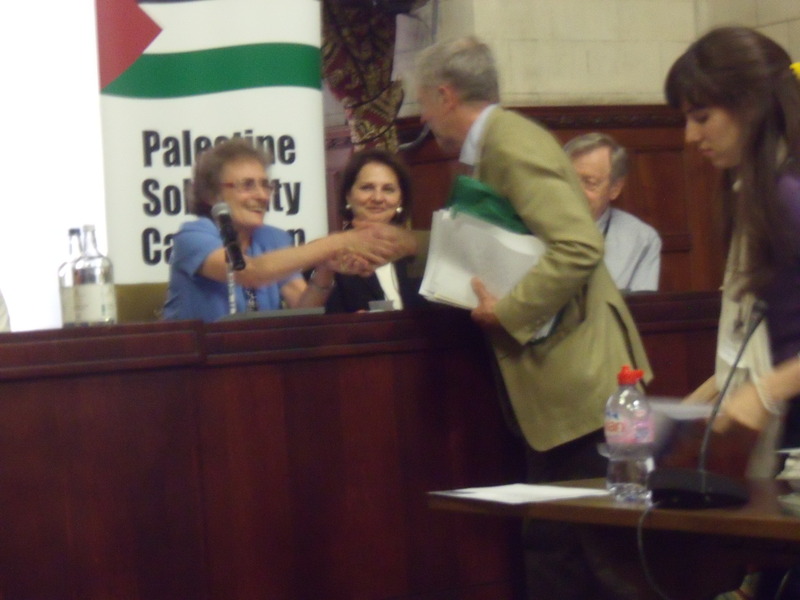 If Sarah or Betty Hunter or anyone from the Palestine Campaign wishes, at any stage, to denounce Hamas after reading Article Seven of its Charter then please get in touch and I will publish any response on this blog.